Tranquil, spiritually rich and full of breathtaking natural wonders, Wakayama is Japan's best kept secret. Here are seven ways to get to know this remarkable destination. Set among the world’s most sacred mountains, Wakayama is a treasure trove of ancient temples and shrines. The sacred place that represents Wakayama is Koyasan, the headquarters of Shingon Buddhism and one of three World Heritage sites in the Kii Mountain Range. Serene and mysterious, Koyasan is scattered with 117 temples, 52 of which offer accommodations for visitors as shukubo (temple lodgings). At Koyasan’s shukubo—considered among the best in Japan—guests can experience a traditional monk’s lifestyle with meditation, temple services, Buddhist gardens and vegetarian cuisine. Tip: Sample itineraries of the routes can be found here. Book your temple stay in advance by email or fax via the tourist association (eng.shukubo.net). Walking the Kumano Kodo, a network of pilgrimage routes across wild, waterfall-laced mountains, is a fantastic way to experience Wakayama's spiritual countryside. In use for over 1,000 years, Kumano Kodo is a special pilgrimage site, registered as a UNESCO world heritage site, connecting three shrines (the Kumano Hongu Taisha Grand Shrine, Kumano Hayatama Taisha Grand Shrine and Kumano Nachi Taisha Grand Shrine). Indeed, the amazing views and historic remains along the way make this one of the most memorable treks on the planet, with easily navigable routes that include hot springs retreats, delicious local food and rich cultural insight into a relatively unexplored part of Japan. Kumano Kudo is bonded to Way of St. James*, in Spain, as one of the only two pilgrimage routes registered under UNESCO's World Heritage Sites. Tip: Try the Nakahechi, or Imperial route, which stretches from Tanabe City in the west to Shingu in the east-it's the most popular among the seven major Kumano Kodo trails. Sample itineraries of the routes can be found here. *Find out more about Way of St. James here. 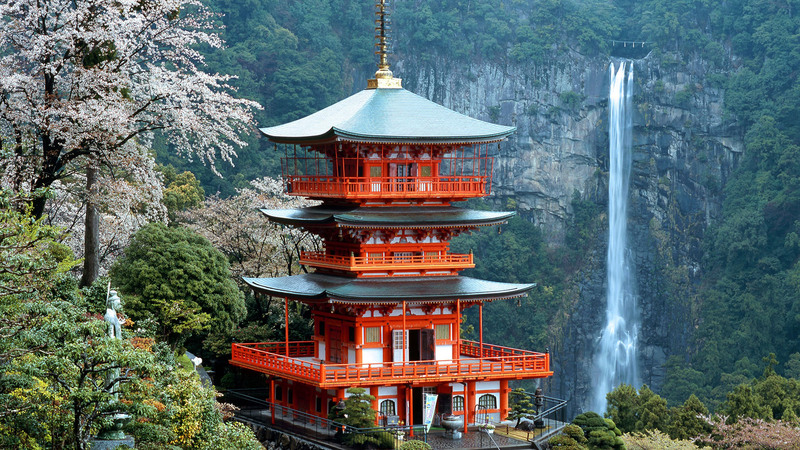 One of the highlights of the Kumano Kodo pilgrimage is the 1,700-year-old Kumano Nachi Taisha Grand Shrine and 133-meter-high falls—the tallest in Japan. Borrow a free walking stick from the path and climb Daimonzaka slope, one of the most beautiful roads in Kumano Kodo. The climb is worth it for the vision of the eminent shrine, the three-story pagoda of the Buddhist temple Nachisan Seiganto-ji Temple beside it, and the crashing waterfalls, which were venerated by the earliest Japanese people. Tip: When visiting Wakayama and the mountainous Kii Peninsula, travelers are often left with a dilemma of choosing between visiting the mountaintop temple town of Koyasan, or exploring the pilgrimage routes and sacred sites of Kumano. With a new daily bus link operating between Wakayama's top spots, visitors won't have to miss out on either. Find out more. The self-proclaimed "Kingdom of Fruit," home of some of the best ramen and freshest seafood in the land, Wakayama's fare is distinct and delightful. Join noodle lovers from near and far for a steaming bowl of Wakayama ramen. Its unique base, made with a savory pork bone and soy sauce broth, makes Wakayama ramen deliciously addictive. Finish your meal with an Arida orange, a thin-rind Mandarin orange with the perfect balance of sweet and sour. For a regional specialty, try tuna rice bowl topped with fatty tuna, and is usually enjoyed with the flavourful local shoyu (soy-sauce). More fresh tuna lands in Wakayama than anywhere else in Japan. Quench your thirst at Minabe, the largest ume (Japanese apricot) producer in Japan, where you can get tipsy on sublime ume liqueur (Umeshu). Tip: Sample sushi with a twist. Some Wakayama sushi bars replace raw fish with watermelon, grapes and peaches. Find out more about our amazing local cuisine here. Relax and rejuvenate at one of Wakayama's many ancient hot springs, or onsen, each set in a unique environment. One of the most popular is Saki-no-yu in Shirahama, a public bath right on the shore of the Pacific which has refreshed travelers and locals alike for over a millennium. Or visit Sennin-buro in Kawayu, one of Japan's biggest open-air baths, a natural onsen created by a dam. 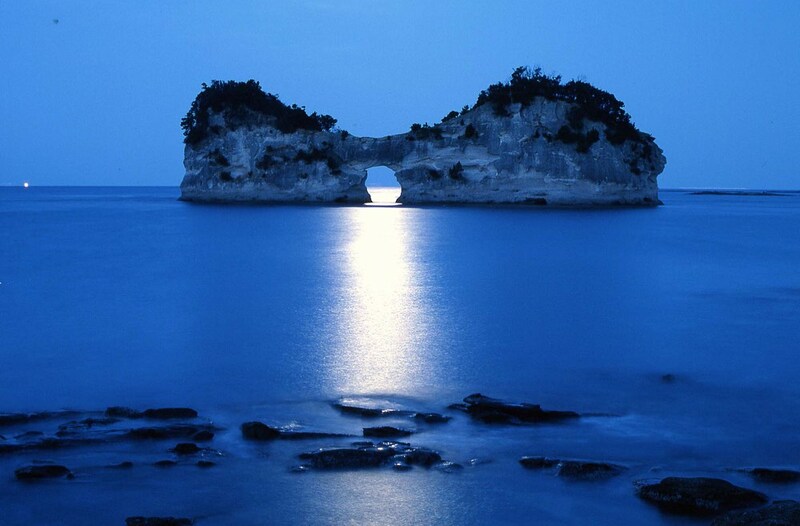 Or become one with the sea in Katsuura onsen, which faces the Pacific Ocean. Visit the Hongu Onsen-kyo area located close to the Kumano Hongu Taisha Grand Shrine, where you can relax in one of Japan’s oldest and most famous hot springs, Yunomine onsen. This is home to Tsubo-yu, a bath designated as a UNESCO World Heritage Site that is for private use for one or two people for 30 minutes. Tip: For a fully clothed onsen experience, you can soak your feet in hot spring water while you dine at Ashiyu-Yokocho, a Japanese restaurant and feet onsen in Shirahama. Find out more about Wakayama's relaxing onsens here. As you fly into Nanki-Shirahama Airport look out for the stunning beaches down below. The name Shirahama is Japanese for "white beach," and as you head toward the region, you’ll see sugar white beaches and deep blue waves crashing against craggy cliffs. Fireworks are held during the summer nights too. Tip: Don’t miss Engetsuto Island, an uninhabited rock isle with a round sea cave open in the middle of it, and Sandanbeki Rock Cliff, with 60-meter-high rock walls extending about 2 kilometres from south to north. Sample itineraries of the routes can be found here. If you are looking for a relaxing and luxurious stay, experience a night or two at Nanki-Shirahama Marriott Hotel, Infinito Hotel & Spa Nanki-Shirahama, Shirahama Key Terrace Hotel Seamore or Kisyu Shirahama Onsen Musashi. Undoubtedly, the most exhilarating way to enjoy and understand Wakayama's nature and its beauty is riding on a bicycle. From majestic mountains to dynamic coastlines, Wakayama offers cycling enthusiasts various route options that total up to near 800 km in the prefecture. Wakayama boasts itself as a dreamland for cyclists - climb uphill the sacred mountains, trail along the rocky Seto Inland Sea coastline, and dip into hot springs at the end of the day. The lack of congested roads and traffic lights, make Wakayama one of the friendliest places in Japan for cyclists. For casual riders, one-day rental at popular spots like Shirahama Beach or Wakayama city is available locally for tourists. For curious starters, try the 13km route that circles around Shirahama beach and hot springs (onsen), close to Nanki Shirahama airport. If you want to take on challenge, ride 94km to the southernmost tip of Honshu Island in Nanki Kumoano Geopark. For more routes and information, click here. Wakayama and its spiritual spots are convenient, and easy, to get to by bus, train or plane. Japan Airlines (JAL) offers direct, 75-minute flights to Wakayama's Nanki-Shirahama Airport three times a day from Tokyo. JAL’s Japan Explorer Pass—exclusively available to international visitors—lets you pre-purchase up to five domestic flight sectors for a fixed low fare. This special fare is available year-round and up to 72 hours prior to departure, valid for travel to over 30 cities in JAL’s domestic network. Click here for more information. Wakayama can be accessed on the JR Hanwa Line and the private Nankai Main Line, both of which run south from Osaka City. JR Wakayama station can be reached by Limited Express trains from Shin-Osaka station, departing every hour. There are also five daily Limited Express departures from Kyoto. From major stations on the Osaka Loop Line, regular Rapid trains run to Wakayama every 20 minutes. From Kansai International Airport, Wakayama City is only 35 minutes by train, or 40 minutes by limousine bus. From Osaka, Wakayama City is only 40 minutes by bus or train. From Tokyo there is a direct overnight bus to Wakayama City and Shirahama available. From Osaka, Koyasan is 80 minutes by train. Take advantage of the KIX-Koyasan airport express bus service for direct access to Koyasan from Kansai International Airport (The bus will operate everyday from September 2018 onwards). From Kansai Airport, Koyasan is 115 minutes by train. You can also get on a train from Osaka, Kyoto or Nara. You can take a train from Kyoto, Osaka or Nagoya and transfer to a bus that will take you to Kunano Hongu Taisha Grand Shrine. Getting to Shirahama is convenient either by train, airplane or bus.